This past week I had the great pleasure of attending the 4th annual Andina workshop in Bariloche, Argentina, organized by Mariana Chiuffo (Inibioma Conicet), Roger Cousens (U. Melbourne), Kay Hodgins (Monash U. ), Ingolf Kuhn (UFZ, Halle), Brendon Larsson (U. Waterloo), Martin Nunez (Inibioma Conicet), and Bruce Webber (CSIRO, Perth). We enjoyed spectacular scenery in the Patagonian Andes while deliberating on the topics of local adaptation and range expansion, particularly in invasive species and those responding to anthropogenic change. In total, 36 researchers with diverse disciplinary backgrounds attended. I got to know a lot of people, made friends, built collaborations, and am very excited about future directions. I presented the results of my environmental niche modeling work at the 2016 Weed Science Society of America Meeting in San Juan, Puerto Rico. I attended the meeting with my advisor, Jacob Barney, and Dan Tekiela, a graduate student in Jacob’s lab. The weather was lovely and we had an excellent time escaping winter’s grip to enjoy some sunshine and sea air! We also had a fantastic conference, meeting new people and learning about the exciting work that WSSA members are doing. Congratulations to Jacob for winning the Outstanding Early Career Weed Scientist award! I recently presented the results of my niche modeling work at the 2016 Northeastern Plant Pest and Soils Conference in Philadelphia. I went the the conference along with most of the rest of my postdoc advisor’s (Jacob Barney’s) lab and we had a great time. 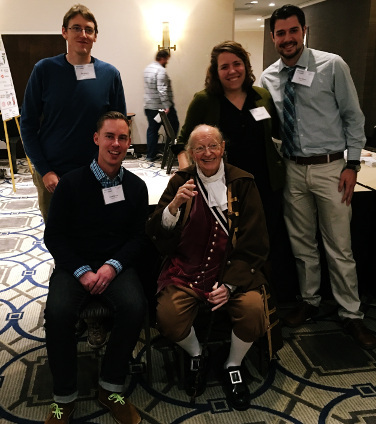 I met a lot of people, including the First American, Benjamin Franklin, who looked great despite being only a week away from his 310th birthday. At the conference, I presented the results of our study of climatic niche shifts in introduced species. Jacob and I have found that species experience major niche shifts as they cross continents. This work is in preparation for submission. Also, congratulations are in order for “Little” Dan Tekiela, who won the Robert D. Sweet Outstanding Graduate Student Award and placed first in the Student Paper Contest. Virginia Tech also won the NEPPSC quiz bowl, besting teams from Cornell, Penn State, UMass, Maine, NC State, and Delaware, as well as the EB-ESA Linnaean Games. Graduate students Morgan Franke and Dan Tekiela both gave excellent presentations of their research. On Thursday at the 2015 Ecological Society of America meeting, I presented preliminary data from an analysis of the global distributions of 1135 introduced species. We find that species experience massive niche shifts as they cross continents. The magnitude of these niche shifts depends upon the methods used to remove sampling bias. 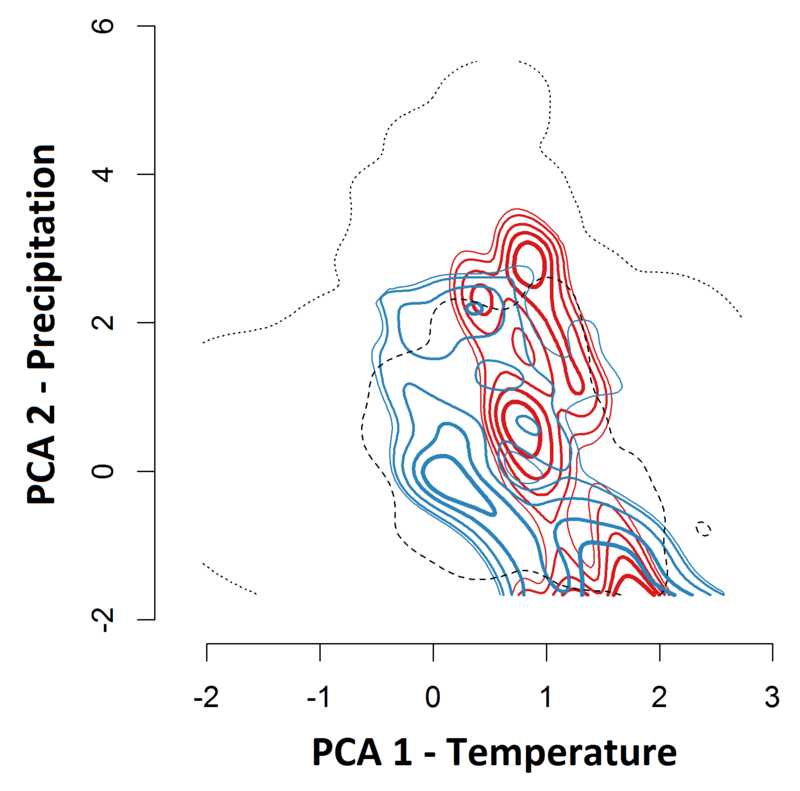 These data have significant implications for our ability to use native-range data to predict future distributions in the introduced range — a critical issue in the development of invasive species risk assessments. Fortunately, I was able to finish my talk just before a fire alarm cleared out the convention center! Big ups to Dan and Morgan, the students in my post-doc lab, for giving great talks. Dan presented his study of non-additive effects of dual invaders, and Morgan presented her work on restoring autumn olive-invaded surface mine sites. Surface mining in Appalachia involves complete mountaintop removal. The topology, plant communities, and “soil” of these sites are 100% artificially reconstructed and have to be seen to be believed. Jacob, my advisor, presented our work on evaluating genetic and phenotypic variation in 70 US populations of Johnsongrass, a devastating invader. Two phases of invasion: Initial invasion (red) appears to have been in warmer climates. Later in invasion (blue) Johnsongrass has expanded to cooler climates. On Thursday, at the Weed Science Society of America meeting in Lexington, I presented the results of a large scale survey of phenotypic differentiation in 499 accessions of Johnsongrass (Sorghum halepense) from 70 populations throughout the United States. Jacob Barney — my postdoctoral advisor — was initially scheduled to present, but I took his place when a scheduling conflict prevented his attendance. I had a great meeting and met a lot of wonderful people. Special congratulations to Kate Venner, Sandeep Rana, and John Brewer from the lab upstairs for their recognitions and accomplishments at the meeting.